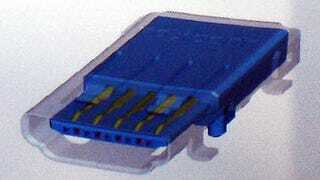 USB 3.0 could take off fast. We believe that the connectors were shown for the first time publicly at this year's CES, and at least one manufacturer is already working the spec into their laptops. Eagle-eyed scouts at The Register spotted two USB 3.0-like ports in the Asus' M50 laptop.